A doctor examines a malnourished child from southern Somalia at a refugee camp in Mogadishu, Somalia. The United Nations says famine will probably spread to all of southern Somalia within a month and force tens of thousands more people to flee into the capital of Mogadishu. As the famine in southern Somalia worsens, aid experts fear that corruption and the politics of terrorism are crimping the flow of humanitarian relief to areas where starvation is worst. Abundant U.S. aid targeted for the Horn of Africa cannot directly reach starving people in southern Somalia because it’s blocked by Al-Shabaab, an Al-Qaeda-aligned Islamist group labeled a terrorist organization by the U.S. State Department. That tag, in turn, also prevents any U.S. citizen from conducting business or distributing materials that could benefit suspected terrorists. Right now, $580 million in aid designated for the Horn of Africa by the U.S. government – the most from any one country – is directed at the Somali refugees who have migrated to camps in Kenya and Ethiopia. The aid is distributed by a variety of international aid groups. Help is also being trucked into Somalia via United Nations and non-aligned humanitarian programs – but a lot of the foodstuffs and other material are siphoned off by theft and corruption by officials in the country’s nominal government, according to aid experts. Mutual distrust between the U.S. and Islamist militants has made matters worse. EJ Hogendoorn, International Crisis Group project director for the Horn of Africa, said corruption is widely acknowledged as a problem, but it should not be the main debate at the peak of the famine. “Now the challenge is how to minimize corruption so that at least some assistance goes to those who urgently require it,” he said. “Al-Shabaab is not the only threat in Somalia. Even if the Federal Transitional Government (FTG), whose powers are restricted barely to the capital city, Mogadishu, gains full control of the relief assistance, the possibility of corruption in distribution will still remain there,” Hogendoorn said. Hogendoorn added that Al-Shabaab is not as powerful as depicted in the media. The organization is internally divided, he said, between hardliners who spurn international aid and more pragmatic leaders who seek foreign assistance. “The best way to operate in that country is to build partnership with the local authorities rather than working in isolation,” Hogendoorn said. Al-Shabaab is a splinter from a larger militant faction forced out of power in Somalia by Ethiopian and African troops a few years ago. Militant power in Somalia grew rapidly after the United States withdrew the forces it had sent to Somalia to protect food distribution in the early 1990s. U.S. troops left a power vacuum in the wake of clashes that led to a bloody shootout made famous by the “Black Hawk Down” book and movie. Al-Shabaab is suspected of carrying out a terrorist attack in Uganda in 2010 and of being associated with the authors of other bombings in Kenya and Ethiopia. A U.S. military drone strike this summer was aimed at leaders of the militant group. U.S. Special Forces also have targeted Al-Shabaab. U.S. government officials say the blame for delays in relief efforts must be put on Al-Shabaab, which has not allowed enough aid to enter territory it controls. Last week, the United Nations High Commission for Refugees (UNHCR) said death rates among new refugees coming from Somalia to Ethiopia had reached “alarming levels”. Since June when the Kobe refugee camp in Ethopia was established, at least 10 children under the age of five have died every day. The death rate has been compounded by an outbreak of measles. According to U.S. government estimates, at least 29,000 children under age five have died in the past three months since famine reached acute levels in the Horn of Africa. Some 12 million people are facing starvation while 3.2 million Somalis are in “immediate need of assistance.” The UN says it requires $2.4 billion in aid supplies to assist drought victims, while an additional $1.4 billion is needed to contain the famine. But the UN has only received $1.1 billion in response to its appeals. U.S. officials recently hinted at softening the restrictions it has placed on direct aid to parts of Somalia, under the Office of Foreign Assets Control (OFAC). That rule forbids Americans from doing business with designated terrorist individuals and organizations. But the restriction remains and the pace of providing assistance to the famine victims has frustrated many in the aid community. Critics of U.S. policy point to the International Committee of Red Cross, which is active in the famine zone. The organization says it has not been threatened by Islamic extremist groups. The ICRC has managed to reach to 162,000 starving people in areas controlled by Al-Shabaab. Yves van Loo, an ICRC official based in Somalia, said his organization made sure to include local leaders in setting aid plans, emphasizing the organization’s principles of neutrality, impartiality and independence. “ICRC’s security was insured by the ICRC itself. Our main protection is the acceptance by all,” van Loo said. It is not enough, though, to convince U.S. officials that Al-Shabaab won’t sabotage relief efforts. 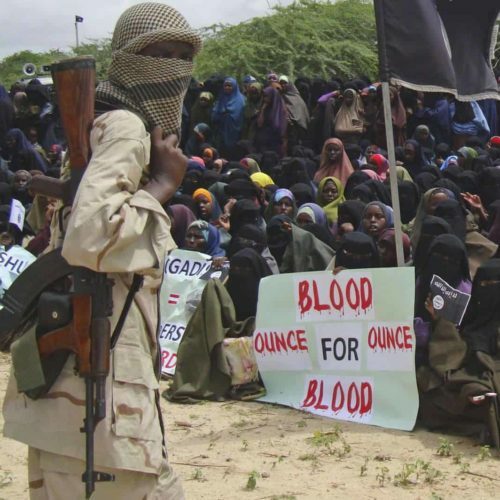 “Al-Shabaab has given mixed signals on whether it is lifting its ban on humanitarian agencies,” said USAID’s Johnson. U.S. officials said aid restrictions to Somalia are in place to prevent diversion of relief assistance. They fear that Al-Shabaab will further consolidate its grip over the region if it gains control of international relief supplies. While the U.S. has withheld some funds from the U.N. relief agency, the world body has moved forward with aid to Somalia, policing its distribution through an internal mechanism called post-distribution monitoring, rather than strictly follow American rules on aid. Spokesman Andreas Needham said the UN’s accountability and transparency measures fulfill U.S. government requirements. “We are hopeful that there will be U.S. funding for UNHCR Somalia in the context of the current emergency,” Needham told ICIJ.